To utilize an overly used cliche, this is a must-read for any long-time Mavs fan. It can be difficult to make non-fiction interesting when you already know the outcome, but this book kept it interesting. The chapter on Game 6 of the Finals did a great job of keeping me on the edge of my seat. All-in-all, a very well-written account of a season that I will always remember. A great job by the Sturminator. I have been Sturminated. The perfect time to read this book would have been before the beginning of the 2010-2011 season or 5 years from now when the pain of the 2011-2012 season has subsided. It has all kinds of behind-the-scenes insight into the team and the organization, but I couldn't see them through the tears that filled my eyes during the chapter about what an important piece Tyson Chandler was, knowing that the Mavericks did nothing to try to keep him. A competent re-telling of the Mavs 2011 run through the NBA Playoffs culminating in a championship win. Definitely one for the fans. Sturm is succinct, despite some idiosyncratic rhetorical crutches (e.g. - "surely..."), and he keeps the ball moving from a pace perspective. It helped to have the kind of access he got after-the-fact. One day, I'd love to read about this run from, say, Jason Kidd. It would provide more inside-the-huddle color. Obviously swayed by my love of Dallas sports and The Ticket; this book helped me relive the awesome Dallas Mavericks championship run culminating in the final match up against the dreaded and hated Miami Heat. In a story of a special bond among teammates and redemption this book is a must read for any Dallas Mavericks fan (or Miami Heat hater). 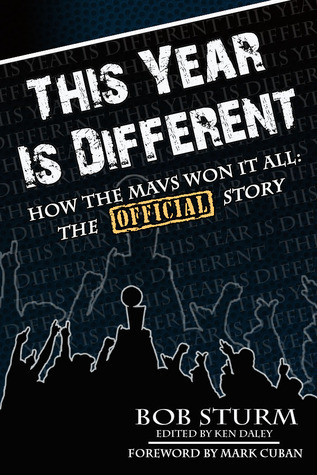 As a dedicated Mavs fan, this book offered literally no insight at all into their title run of 2010. It's a quick read and given the last couple of Mavs seasons, I'm not above the nostalgia of reliving past glory, but if you follow the team at all you'll learn nothing new or interesting about Dirk and company. Great wrap-up of the Mavs 2010-2011 Championship run. Makes me love the greatness of Dirk even more. And Sturm's writing is much more concise than his sometime ridiculously long questions and thoughts he has weekdays on BaD Radio. Any die-hard Mavs fan will love this book. Sturm brings back every important highlight from the season and post season that captured this astonishing sports story. I loved reliving the season and the victory! Growing up an across the board Dallas sports fan, this Mavs Championship was my favorite by any team from that city ever. What made it amazing was that it just wasn't supposed to happen, but in this excellent book, Bob Sturm takes us step by step and explains just how it did.